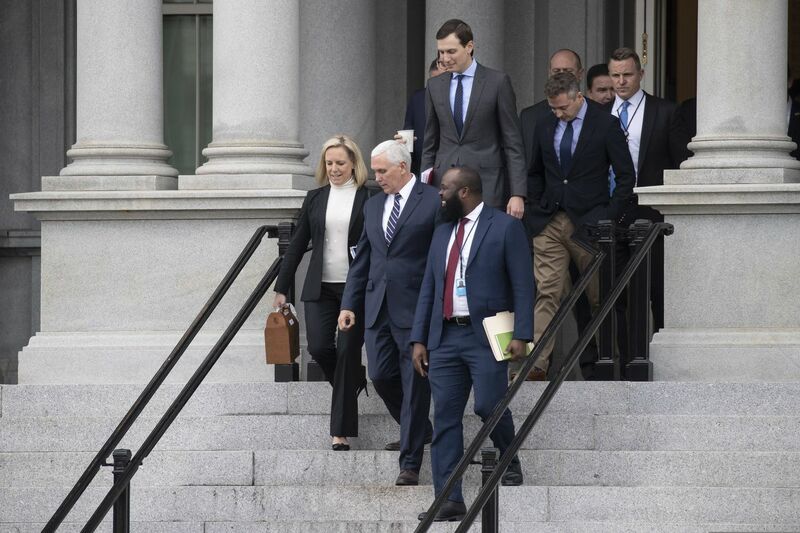 WASHINGTON (AP) — White House officials and congressional aides are returning to discussions Sunday to find a way to reopen the government after emerging from the first round of weekend talks without a breakthrough. President Donald Trump tweeted Saturday: "Not much headway made today." The president later tweeted that he planned to go to his retreat at Camp David, Maryland, on Sunday morning to discuss borders security and other topics with senior staff in a meeting separate from the negotiations. Democrats agreed there had been little movement Saturday, saying the White House did not budge on the president's key demand, $5.6 billion to build a wall along the U.S.-Mexico border. "While President Trump threatens to keep the government shut down for 'years', Democrats are taking immediate further action to re-open government, so that we can meet the needs of the American people, protect our borders and respect our workers," Pelosi said. In an interview with NBC's "Meet the Press," set to air Sunday, Mulvaney argued that the administration was willing to deal. He said Trump was willing to forgo a concrete wall for steel or other materials. "If he has to give up a concrete wall, replace it with a steel fence in order to do that so that Democrats can say, 'See? He's not building a wall anymore,' that should help us move in the right direction," Mulvaney said. The president has already suggested his definition of the wall is flexible, referring to slats and other "border things." But Democrats have made clear they see a wall as immoral and ineffective and prefer other types of border security funded at already agreed upon levels.